On the ground in Venezuela: this country is being cut off from the rest of the world. The first thing to understand about Venezuela today is that it’s becoming exceedingly difficult to even get here. Nearly every major regional and international carrier has discontinued service to/from Caracas. Due to safety concerns amid all the chaos and violence here, Lan Airlines in Chile (now merged with TAM in Brazil as Latin America’s biggest airline) no longer serves Venezuela. Aerolineas Argentinas, based in Buenos Aires, stopped flying to Caracas last month. Delta Airlines. United. Air Canada. British Airways. Alitalia. Aeromexico. All of these airlines no longer fly here. Even Avianca, the national carrier of Colombia (right next door) terminated its daily flight between Bogota and Caracas back in July. There are only a few routes remaining– I flew from Panama on Copa Airlines. And it was ridiculously expensive (more on that below). 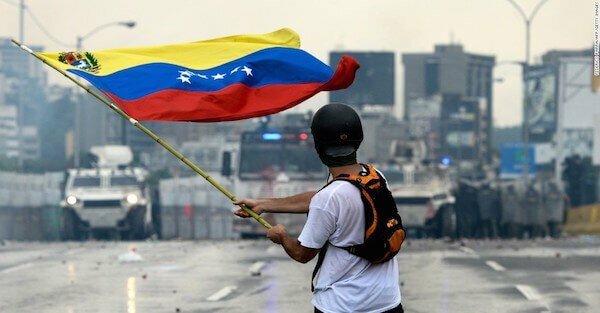 Overall, Venezuela is being systematically cut off from the rest of the world. Foreign governments are starting to put up barriers to prevent Venezuelans from coming to their countries. For example, the Panamanian government decreed a few weeks ago that Venezuelan citizens will require visas in order to visit Panama, effective October 1st. And there will likely be more of these visa requirements as the situation here in Venezuela deteriorates. Moreover, the visas are becoming harder to acquire. I keep hearing stories here from people who have been rejected for travel visas to other countries, mostly because the foreign consulates believe [perhaps accurately] that a Venezuelan tourist will attempt to stay illegally in their country. There’s a story, for instance, about a Venezuelan family who applied for a visa to Australia to visit family there. But even if someone here in Venezuela is lucky enough to be able to obtain a visa and find a flight, the cost of travel is now prohibitive. My roundtrip ticket between Panama and Caracas cost over $2,000. It’s only about a two hour flight. This is a simple supply/demand issue. There are hardly any airlines flying out of Venezuela, and a whole ton of people who want to get out. So the price goes through the roof. Bear in mind that due to the nasty hyperinflation that Venezuelans have suffered, the minimum wage here works out to be about $32/month. So it would literally require a minimum-wage earner more than four years of saving 100% of his/her paycheck just to afford a ticket out of this place. This means there are millions… and millions… of people trapped here. And they’re suffering immeasurably. For a place that used to be one of the wealthiest countries in the region, Venezuela is now completely destitute. People are running out of food. Medicine. Even toilet paper (yes, the stories are true). The reversal of fortunes is remarkable. And the lessons are abundant. First and foremost, Venezuela is an obvious example that rational, thinking people should have a Plan B. No matter how peachy and wonderful things may seem, it makes sense to have a backup plan… especially if your government happens to be running woefully unsustainable finances as Venezuela’s government has done for years. At a minimum, that backup plan ought to include some savings, ideally denominated in a stronger currency or an asset like gold that has a 5,000+ year history of holding its value, and held overseas in a stable country out of harm’s way. Additionally, consider obtaining a second residency in a foreign country that you and your family enjoy. Legal residency in a foreign country provides a LOT of advantages. It means that you’ll always have a place where you and your family are welcome to go… and in many cases to work, invest, and do business. Many foreign residency programs also make you eligible to apply for citizenship and a second passport after a few years have passed… which provides even MORE benefits that could be passed down to your children, grandchildren, and future generations. In many countries, legal residency can be incredibly straightforward to obtain. We’ve written a lot about residency in places like Panama, Chile, Andorra, Philippines, Belgium, etc. But nearly every country on the planet has standard procedures to obtain residency. So there really is a world of options out there. Venezuela shows that when crisis hits, it’s too late. The options dry up. So, again, a rational person develops a Plan B… now. When everything is just fine. Think about it like insurance; you don’t wait until the house is engulfed in flames to buy a fire insurance policy. You buy the policy when everything is still fine. And the great thing about a strong, robust Plan B is that even if nothing bad ever happens, you won’t be worse off. There’s no downside to having the legal right to live, work, invest, etc. in a foreign country that you and your family really enjoy… where one day you can obtain a second passport. There’s no downside in having some precious metals or emergency savings held at a conservative bank in a stable jurisdiction. But if something ever does happen, you and your family will be covered.